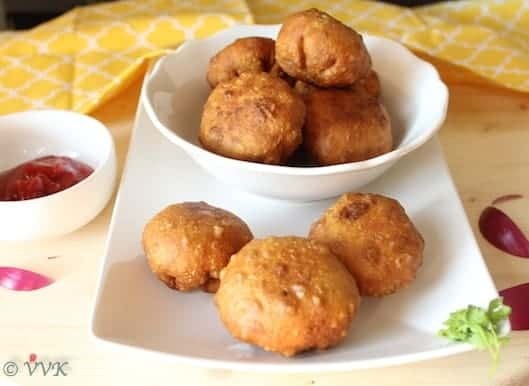 Kachori or Kachauri or Kachodi or Katchuri is another popular recipe from North India. It is popular in Delhi and also in Rajasthan. Wiki states that Kachori is supposed to have originated in Uttar Pradesh or Rajasthan. I am not worried about its origin or who invented. All I wanted to say is big thanks to the person who invented this recipe. IMO, Kachori is a cousin of samosa. There are both sweet and savory Kachori. 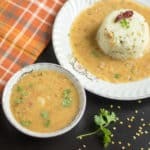 When I researched about this recipe, I was super surprised to find oodles of this kachori recipe. Finally thought of keeping it simple, so here I am presenting the savory matar kachori or green peas kachori. Thaw the frozen peas and make sure they are in the room temperature. Take the all purpose flour, wheat flour in a wide bowl. Add the ghee, baking soda and salt and mix well. Now slowly add water and knead it to form a stiff dough. Cover it with wet cloth or tissue and let it sit and meanwhile, prepare the filling. Once the oil is hot, add the chopped onion and cook until they are translucent. Now add the peas and also all the masalas including salt. Mix them well. 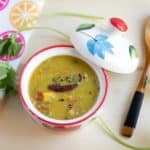 Peas will ooze out water, so no need to add more water and also no need to cover and cook. Cook until all the water evaporates and make sure the peas are tender. Turn off the heat and now the filling is ready. In a wide kadai, heat the oil for frying. Meanwhile, we can assemble the kachoris. Pinch a small lemon sized ball from the kneaded dough. Roll it round and dust it with flour if required. I rolled them all and now add about 1 tbsp of the peas filling. Bring the edges together and close them. Then slightly press them flat with your fingers. Repeat this for all the rolled dough. Once the oil is hot, bring it to medium heat and slowly drop in these kachoris. Fry until golden brown and that’s it. Matar kachoris are ready. I did not use any water for sealing the edges. But if required you can slightly spread water around the edges and seal them. I missed to cover the stuffed kachoris with wet cloth. They were sitting out while I was frying. As we had it right away, it didn’t go dry. But make sure it is covered with wet tissue always. 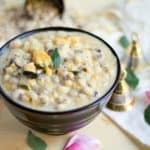 Instead of ghee, you can use oil while preparing the dough. Adjust the salt and spice as per your preference for the filling. While frying, ensure the oil is not too hot. Always fry in medium low heat. 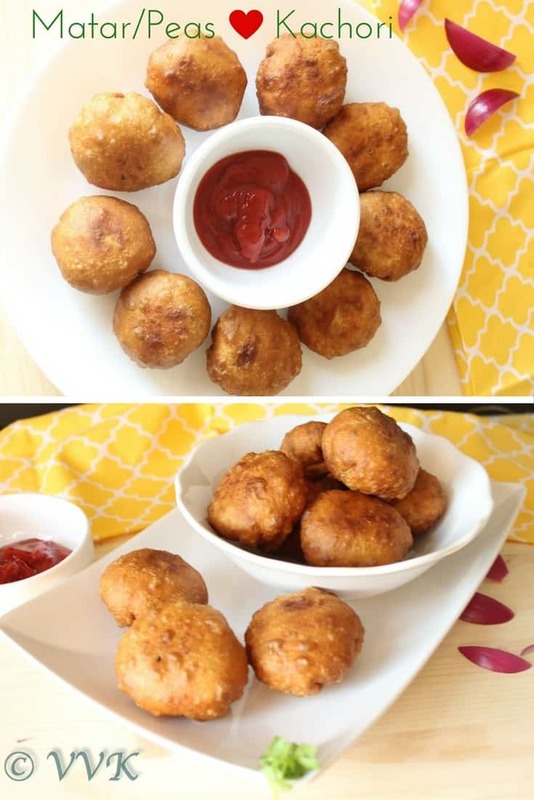 Serve kachori with ketchup or sweet chutney. Matar kachori or green peas kachori is a spicy savory snack prepared with all purpose flour and wheat flour covering with green peas filling. Matar kachoris are my all time fav. Yummy!! Matar kacori looks so yummy. I want to try them now. Lovely kachoris. I love them and these are just like the store brought ones. These kachoris look just like the store bought ones…awesome! Crispy and delicious looking kachori. Love that you used 50-50 APF & WWF, it still looks like the ones from the store. 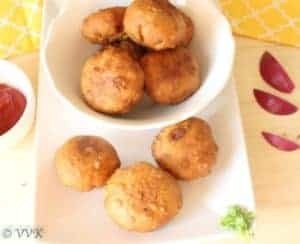 I had tried urad dal kachoris during my initial days of cooking. These tempting matar ke kachori platter is inviting me. Oh wow.. Yeah I read about the different types of kachori.. need to try them one by one. This is a tempting kachori and has come out so well. 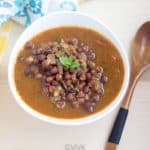 This was one of the recipes for Indian Cooking Challenge long time ago. Oh is it.. Need to do ICC again. Been long time. Love those bite size kachoris. Great recipes dear.! Wow a plate of matar kachori will definitely makes me happy if you could have send me rite now. Alluring kachori there. They look tempting. 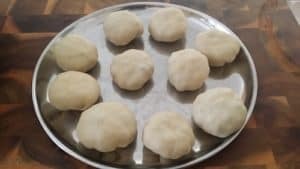 I have not made kachoris so far. High time to start. Super inviting platter of kachoris. Watching shows like Diya Aur Baati, I always wondered what kachoris were made of but never bothered to check or learn. Thanks to you, i now know. The ingredient list is simple and the process too doesn’t sound difficult. By the way, the Kachoris look so tempting. I am in office and they look mouth watering! Just wondering how the insides look.. maybe, a cut picture next time please. hey how are you? Long time.. hope things are fine at your end. Thanks.. sure, will post the cut picture next time. I made a batch of 10 and after clicking the pics, all got vanished just like that. Then I realized I missed the inside picture. Same happened with one other recipe too. Actually I have a video too for this. But I couldn’t find time to edit it. Need to upload it later. Delicious kachoris..even I make these since they are a big hit in the house.They look super tempting dear. Thanks a lot. Please do try and let me know how you liked it.